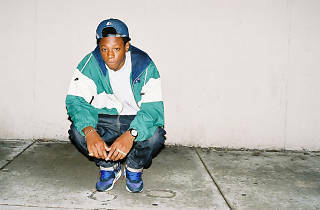 The rapper Joey Bada$$ was born Jo-Vaughn Virginie Scott and touts the usual mixtapes and group appearances that tend to set the stage for a breakthrough solo bow. From Bed Stuy, like most of the best, the rising star last hit town playing the zoo with Disclosure. With new single "Big Dusty" Bada$$ makes a formal showing without the whole crew. His debut, B4.Da.$$, is one of those forever-in-the-making rap records that doesn't even seem real anymore.